Commercial & Residential Waste Disposal St Luke's EC1 | RDA Cleaning & Maintenance Ltd.
You have some rubbish that you need to be taken care of? Don’t worry we have it covered. RDA Cleaning & Maintenance Ltd. is a professional waste disposal company, specialized in rubbish removal St Luke's EC1 services. All the services that we provide are great for both residential and commercial clients and are in accordance with the British waste management requirements. Our vetted professionals do their best on the job. That means that our company can guarantee you a high-quality service thanks to them. But not only are our service of the highest quality, they are at affordable prices as well. While you are relaxing, the helpful rubbish collection St Luke's EC1 technicians will do the entire job. No need to move or dismantle anything! The experienced technicians will dismantle all the big furniture and junk and pack the pieces, themselves. If you have more doubts or details you to get, contact us and we will arrange the professional junk removal service in a most convenient for you time and way. Our high quality waste disposal service in St Luke's EC1 is a complex procedure with specific chores and actions to handle depending on the property and the junk type we face. In all cases, we promise to execute the service fast and safely. Once the service is arranged for you, expect urgent visitations by our expert and trained technicians. They come to your property for a check in advance. According to the volume and the type of the rubbish, we provide you an offer and free quotation. A plan for the entire service is also offered to the customer. Once you agree, we get ready to remove your junk as soon as possible! RDA Cleaning & Maintenance Ltd. is a well-known professional waste collection St Luke's EC1 company. We know and always apply the most optimal formula for disposal wasting in your home or in your office space. The experienced technicians are trained to handle each individual case with a personal approach. Once they check out the junk you want to deal with it quickly, they will make you an offer. Only after decent negotiations about the correct date, the final price depending on the junk size, the transportation route and the details for the packing, the contract is signed. Note that you do not have to provide us any bags, cardboard or other packing materials. We only need some parking space to leave the van with all the necessary materials we will bring. Make the right and smart decision - call the commercial and residential rubbish removal St Luke's EC1 specialist at 020 3404 1646! Get rid of that junk at affordable rates and without even sweating. 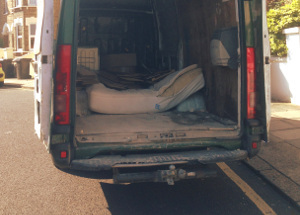 Our reliable rubbish removal company guarantees great final outcome and promises full satisfaction for all our clients!